7.85 points at 26 votes (rank 120). 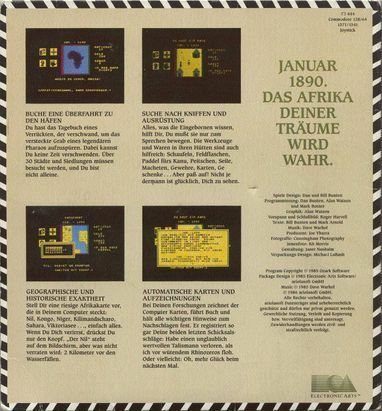 "The Heart of Africa" marks Dan and Bill Bunten's fourth computer collaboration. Their first, Cartels and Cutthroats, set the standard for Business Simulation games way back in Apple II plus days. Their second, M.U.L.E., is the first computer game that's a true rival to classic multi-player board games like Monopoly and Risk, their third, The Seven Cities of Gold, invented a whole new category: games played on a geographically and historically accurate dynamic map. Their work has already won them a wall full of "Best Game of the Year" awards. We think they're going to need a bigger wall." 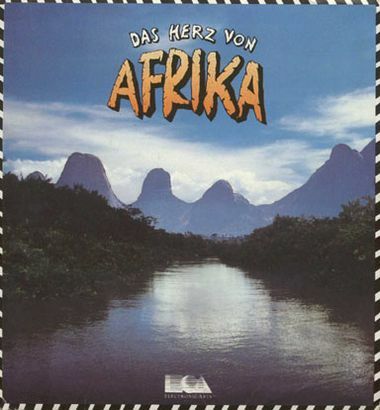 In 1890, the explorer Mr. Primm disappears in Africa and leaves his whole riches to the one who finds the legendary "Heart of Africa" until 1985. To reach this aim, the player has to gain the sympathies of the tribes of the five regions, on the one hand to get the descriptions to smaller treasures and on the other to get new hints to the location of the tomb of the pharao. 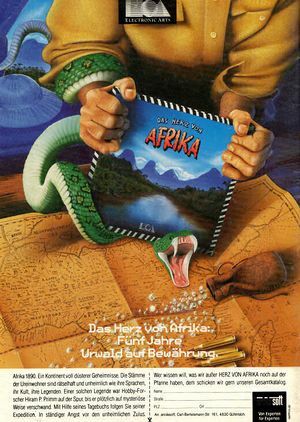 In every region the most valuable items are different and so the player has to cross the continent several times to get enough treasures and hints. 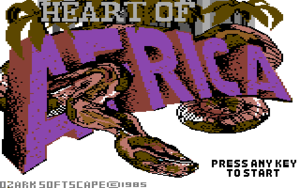 There are no more loading times after the start of the game, however, the game permanently accesses the floppy and an extra disk is needed for saving the up to 10 game scores. Use the joystick to move on the map. When you stop, you can change the joystick controls by pressing the fire button. Now you have four icons available next to the action window: use the joystick to move the frame around the icons, the corresponding function is then shown below the icon. By pressing the fire button you can choose the framed icon. If there are further options to choose from after that, you can use the joystick again to move the coloured mark. To choose a marked option press the fire button. The diary icon can be used to flip through the entries: The information from the tribal chiefs contain important hints. The direction icon gives you a quick overview about how much of the region you have already explored. In the towns and villages you reach the sketches that the natives have drawn you by using the direction icon (natives swap goods against gifts. To purchase just stand next to a native in his hut; then you will know what goods he trades. You place yourself on the items: confirm the ones you want to buy by pressing the fire button. Note the price information on the screen. In each town there is a tradesman, who buys and sells items. If you fulfill a tribal chief's desire, he tells you where valuable items are buried). The options icon offers three possibilities. Two of them serve to find out the location and health (if you have problems to find your way, use the location query often). The third gives you the possibility to create hideouts, these are then marked with an X on the map. Most of the time you will still find everything that you have hidden at your return. The object icon (hand) is there to take out items from your luggage, view the map or take medicine. The behaviour of natives towards you, your movability in different surroundings or whether you find buried treasures or not depends on what you carry in your hand. Two important experiences: First: If you get crazy, the joystick input gets unreliable. It requires patience to choose the option that reorganizes your senses. Second: If you lose your eyesight while searching for healing and therefore cannot differ between wrong and right, you should be prepared to bear the consequences. To save your game status and continue playing later, go into the pubs of the harbour towns. If you have no data disk prepared you can also choose the format option. To save follow the instructions on the screen. You are asked to enter a number, so that you can ban 10 different savegames on the data disk. To continue a saved game, just enter the corresponding number, when you are asked to do so. My journey began in Kairo, where I first looked for a shop, to buy gifts, which I kept in my hand and stopped a native on the street. In exchange for a gift, he drew me a sketch of the place, with which I could find the other shops more easily and I avoided looking into each and every house. Then I went to the tool hut and bought me a shovel and in the weapon hut a gun and a machete. Now I only needed a canoe and supplies, which I bought in the market hut. When I left Kairo to the north, I suddenly found a hideout, where I found a map and a rope. Now I went to the Nile to finally try out my canoe. It was well steerable upstream and soon I was at the village of the Nubian, my first discovery for which I would later get money. Further up the Nile and behind the water mouth of the "Blue Nile" started the White Nile; at its edge lay already Khartum. There I bought new supplies and, as I had some money left, I bought expensive ivory at the basar. With this, the further direction was given, as I had heard that the chiefs in the west are especially happy about these. I paddled further on the White Nile to the Lake Albert, and laboriously dragged the canoe to Lake Edward in the southwest. In March I crossed it and a bit further to the southwest there was already the Kongo, which I then navigated downstream. This was a mostly convenient and easy way to travel, only for the Stanley and the Livingstone Waterfall I had to go to the waters edge. 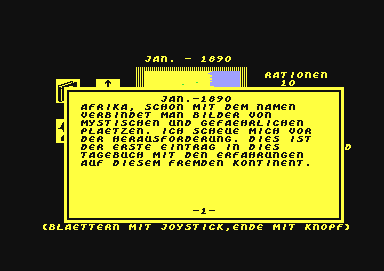 In May 1890 I already reached Boma - not bad, I had crossed half the continent in 5 months time, that gave me hope to reach my aim within the five-day period. From the money for my previous expeditions I bought supplies and gifts, as I wanted to concentrate fully on the new expedition and in the villages you can only swap supplies with gifts. I left my canoe and the rope at the northern edge of the Kongo and headed forward to explorer the first village in the west. The moment had already arrived in June, I reached the village of the Fang and the chief was so happy about my ivory, that he told me that smaragds can be found "where I can watch the sunrise from the great, childless waters." That sounded like the western side of a lake without a river... I left the village into the direction of south and looked at the map in my luggage. Northwest of the Kongo I could not find a lake, but I was sure, that the chief was talking about a lake, that lay inside the western region. So I proceeded further to the north with my machete in the hand and fought my way through the jungle. That way I did not only proceed rather fast, I could also fight a python without getting hurt. At the mountain Kamerun I took another look at the map and now there was finally a lake to be seen in the direction of north. In July I reached the Lake Chad and at the western edge there was indeed the smaragd dump. These were very sought-after in the east and so I marched back to the Nile again through the far plain at the rim of the central region. As I had my gun in my hand during this trip, I could also dispel the wild rhino without getting stamped down. I left the village into the southern direction and discovered the Lake Victoria. Lake Albert and Lake Edward were also close to there, now there was one lake in the south missing ... At the eastern edge I found the village of the Masai, but the chief there only new old lores from Ankh Ankh ... As I still had smaragds, I decided to search for other villages and, in case I would not receive more information, to sell the rest of the smaragds in Sansibar. In Somali I could only hear from the chief, that I was further away from my target than ever. I then turned towards the south to Sansiba, where I only purchased supplies. So I navigated on the Ruvuma to the west again and discovered the Lake Nassa and at its northwestern end also the Lake Tanganyika. Now I knew where the four lakes in sight lay and I discovered also the elephant cemetery when the turn of the year came. I took the tusks and made my way to the east. As the second year was not over yet, I decided to make a small side trip to Kairo, maybe I could spare myself the hike through the desert, if not I needed a water bottle. Also in Kairo I did not get any copper offered, so i just bought a water bottle and supplies and I was already at the Berber in December. It was no surprise that the chief had never heard anything of Ankh Ankh, I already assumed the tomb to be in the south anyway... At least I became honourable friend and didn't have to pay my supplies. In January 1892 I discovered the Emi Kousi, owing to the water bottle I didn't mind the desert hike. In March I visited the Tuaregs and discovered the Tamanrasset. But first I wanted to know where the tomb is, so I went to the next village. 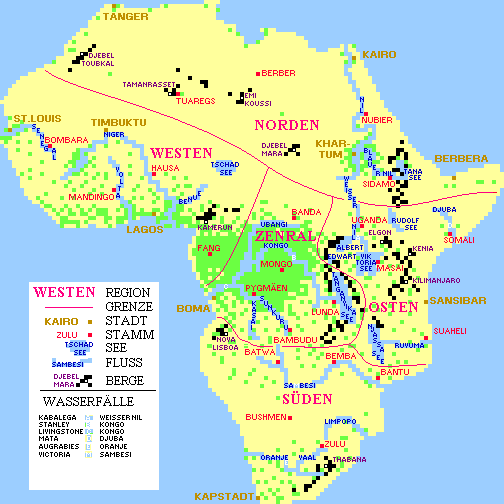 The Bemba assured me, that I am on the right way and so I navigated further into the west on the Sambesi. The Batwa said, I was further away than the last time, so the tomb had to be further in the south. At the Victoria waterfall I abandonded my canoe and marched further to the south. Unfortunately, the bushmen did not know the exact place, but they assured me that I was closer again. The chief of the Zulus could give me the following description of the location of the tomb as a Christmas present: "Between the mountains of the winter" So this meant in the southern mountains... As I did not find anything at once, I wanted to get a rope in Kapstadt, so I would not fall in the mountains. Fortunately, I passed a small ridge and kind of stumbled upon the tomb of the Pharao Ankh Ankh - I had found it, the Heart of Africa! I will go down in history! As the hideouts are placed at the start of the game, it is enough to save the game right at the beginning in Kairo to avoid the 5-year limit. The 62 stands for 90 (out of 1890). So after 4 years just turn down the year. FXXS: "Despite the (too) small game area and the minimal sound, does the game entertain rather well, by the new allocation of the hideouts and the random events it is still fun if ypu had already found the pharao once. Unfortunately, you cannot buy any camels at the nomads in the desert, canoes are very illogical if you are a hundred miles away from the next water... 8 points." ... at the midpoint of a journey from Emi Koussi to the Death of Nivera, seeking waters. actually refers to Mount Djebel Mara. As far as it is known there is no highscore possible in this game.